Etch A Sketch on the iPad – Is art ever a time waste? While what we create on the Etch A Sketch may not be art, it isn’t a time waste either! That is what we tell ourselves as we give the wrong knob a twist once again and we end up with a spike where a line should be. 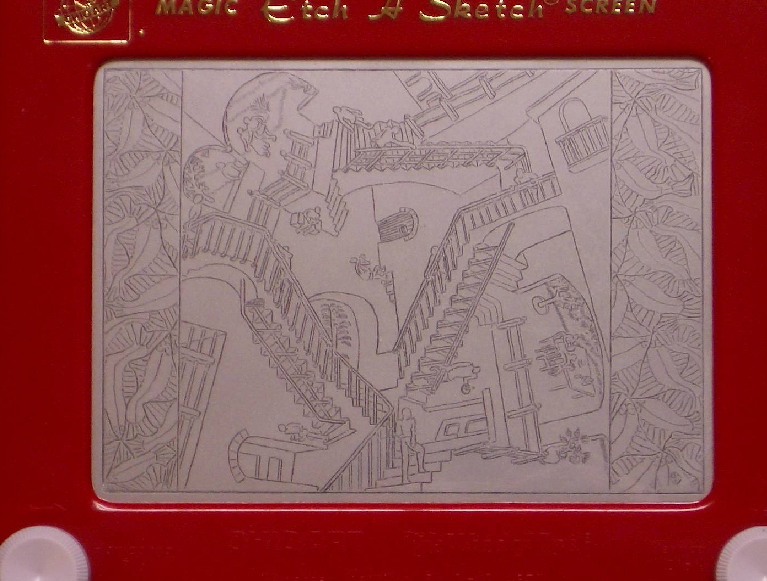 The Etch A Sketch means something different to every person who picks it up. It could be a time as a child when the red plastic device was handed around the room or it could be a college late evening bit of fun amongst friends that may see more than just a lines on the screen. Of course, no one can forget the Dilbert cartoon of the pointy hair boss thinking it was a notebook computer that needed it’s memory cleared. For the modern iPad user, there is now an app for that! It spread pretty quickly down the halls here and the following meetings where quiet as people turned the knobs on their iPad Etch A Sketch to produce… lines with spikes. 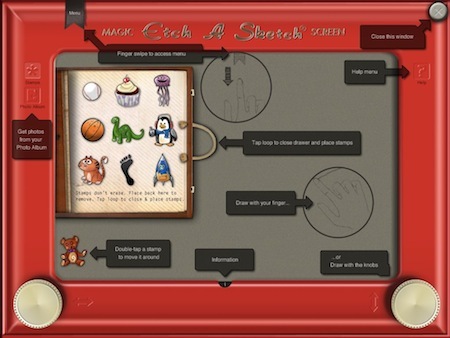 The iPad version of the Etch A Sketch does come with some additional features the one from your childhood didn’t have. 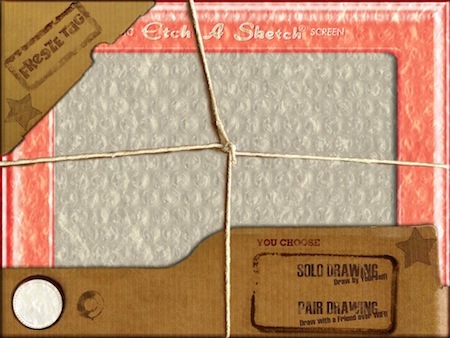 Launching the app, you are greeted with a wrapped up Etch A Sketch with options to draw on your own or with a friend. This isn’t the Etch A Sketch you grew up with. The knobs along the bottom turn which moves the point to create the lines… and shaking erases the screen. The similarity stops there. The iPad Etch A Sketch allows you to draw with your finger (which we avoid telling anyone so they get the full effect) and has color stamps you can drag and drop anywhere on the screen. We did notice that when you shake to erase, that only clears the lines which means you have to return the stamps to the ‘drawer’ when done with them. 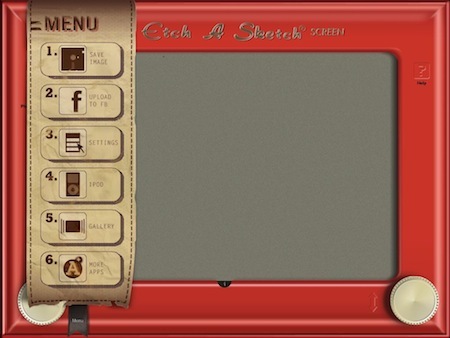 Swiping down on the ‘menu’ flag at the top left of the Etch A Sketch shows a list of options. Including the saving of your work, sharing out on Facebook, listening to music you have in your library and viewing the Gallery of past work. the ‘Settings’ option allows for changing the ‘theme’ (color change of the case) and if your creations are being auto-saved. We wonder if some of the ‘great’ Etch A Sketch artist would ever consider trying the electronic iPad version. The GV Gallery is a great example of the extreme limites of what can be done with a couple knobs pushing out a thin gray line on the screen. 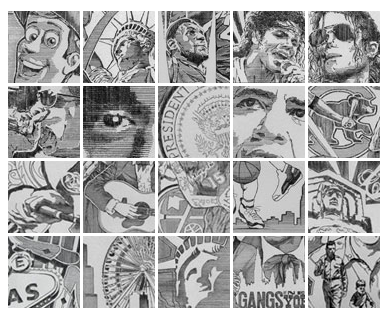 Kevin E. Davis has a very nice group of art he has created on the Etch A Sketch… worth a glance.